The third day of my visit I worked with Zeljko Brdaric, who specialized in test automation and BDD. We added a small feature to his code base, and adding the test first I worked for the first time with TestNG. It did not make any difference as the annotations and assertions looked the same as in plain old JUnit. We had an interesting discussion about using present or past tense in commit messages. I liked this attention to detail. Then I moved on to Dimoco, a company offering mobile payments worldwide. There I pair-programmed with Helmut Jelinek for two days. Helmut had arranged a meeting room for us so we would not disturb other colleagues in the open plan office. 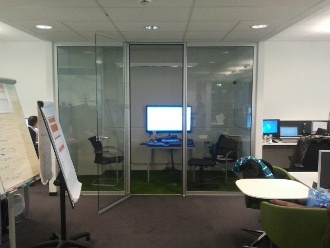 It was a very small meeting room, more like an aquarium ;-) I called it the "pair-programming cell", see its picture on the right. Helmut was responsible for Dimoco's reporting backend which collected events throughout the application and aggregated them for monitoring purposes and we added a small feature to its reporting backend. Helmut had a strict attitude about introducing zero defects and was very serious about checking, reviewing and retesting our changes. I have never met a person checking his or her code so closely. Obviously I liked that and will incorporate some elements of his work flow. Besides pair-programming I finished reading Domain-Driven Design by Eric Evans in that week. I participated in a remote reading group, started by a former colleague Jonny Andersson, back in the days when I worked for IBM. Since January we have been meeting online each week and worked through 15 pages of the book each time. It took us 33 meetings in total to go through the 500 pages of the book and a few meetings were delayed due to public holidays or holiday time in general. We had many interesting discussions during the year which made reading the book more fun and the learning experience much richer. Jonny is preparing for the next reading group right now. It will start January 2014 and we are currently discussing which book to read. If you want to join us, stay in touch.